Kumpleto na line up ng CTM Trail Fest! Choose your own adventure or do it all! 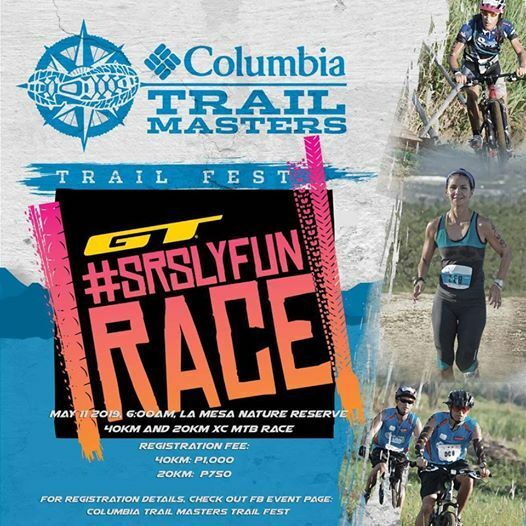 Three big outdoor sports brands will combine to make the Columbia Trail Masters Trail Fest an exciting weekend for every one. Pay the registration fee through our bank accts; to be sent by raceyaya once you completed filling up your online registration form. Reminder: Registration will not be confirmed unless you pay the registration fee and have uploaded your deposit slip to your raceyaya account. No payment, no registration confirmation. No confirmation means you are not registered. RD Cycles: SRK building, Acropolis subdivision, E.Rodriguez, Bgy Bagumbayan, Libis QC. CLAIMING OF RACE PACKET AND SHIRT IS ON MAY 15, STARTING AT 3AM AT THE LA MESA NATURE RESERVE. Or Visit the FB Page: “Columbia Trail Masters Trail Fest or Team A Multisport Solution” for more information.